When I made the spinach and artichoke dip tortellini soup the other day I realized that it had been a while since I had last used tortellini and that reminded me that I had several recipes bookmarked to try including this chili tortellini from Picky Palate. Adding cheese stuffed pasta to an already tasty dish like chili is a fabulous idea and I could not resist making it! 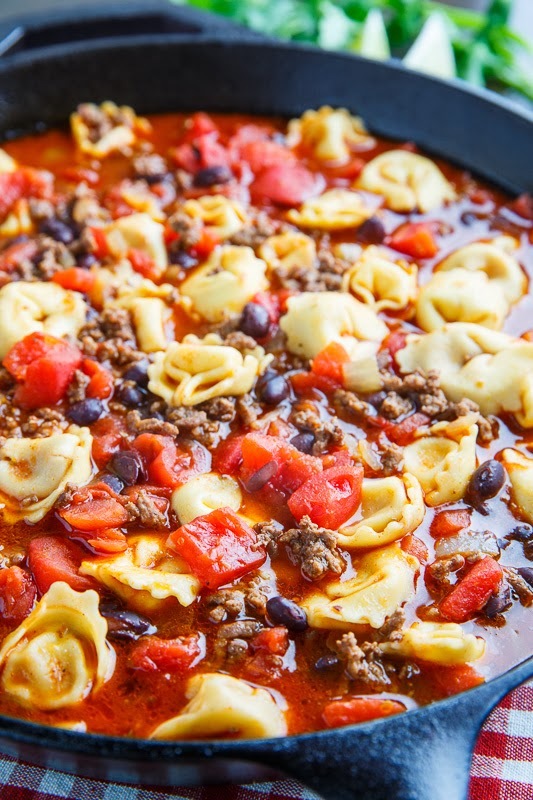 In addition to being super tasty, this chili tortellini is easy to make, it only takes about 30 minutes and it’s made in one pot! You pretty much just need to cook the onions, brown the meat, throw everything in the pot and simmer until the tortellini is ready! 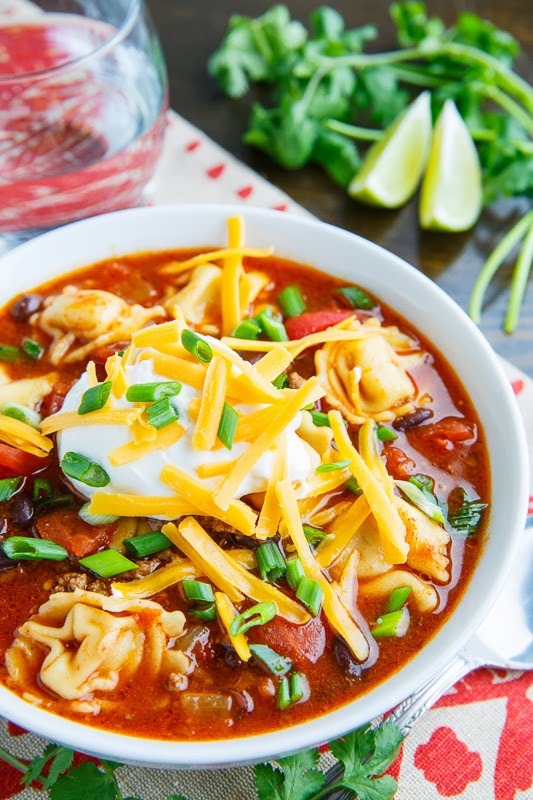 This chili is perfect for a quick work night meal and a great way to enjoy some tortellini! Feel free to serve the chili tortellini topped with your favourite toppings like sour cream or greek yogurt and cheese. Pure comfort food in a bowl! Add the garlic, chili powder, paprika and cumin and cook until fragrant, about a minute. Add the beef and brown, about 6-8 minutes, before draining any grease. Add the broth, beans, diced tomatoes, tomato paste, oregano and tortellini and bring to a boil, reduce the heat and simmer until the tortellini is tender, about 10 minutes. Slow Cooker: Implement steps 1-3, place everything but the tortellini in the slow cooker and cook on low for 6-10 hours or on high for 2-4 hours before adding the tortellini and cooking on high until tender, about 10-15 minutes. Option: Start by cooking 4 strips of bacon, cut into 1 inch pieces, and use the bacon grease to saute the onions instead of the oil. Option: Replace some of the broth with beer or coffee. Option: This chili benefits from simmering for longer so if you have the time, hold off on placing adding the tortellini and simmer for up to 2-3 hours before adding the tortellini and cooking until tender, about 10 minutes. This looks so cozy and delicious. Perfect for these cold March days! I love that you put tortellini in Chili!! Who would have thought!? I bet it is delicious! Yum! This is the best comfort food to have in a large bowl! I love this idea, Kevin! 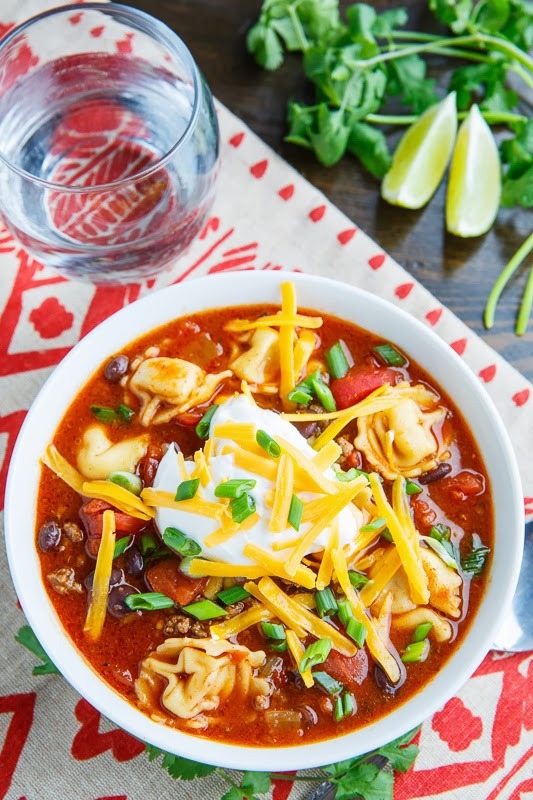 I have a tortellini soup recipe that I make often and love, but definitely need to try this chili soon! What a fun easy hearty meal Kevin – love the beans for extra protein! I will definitely make this , without the meat. Tortellini is so good in broth, a heartier noodle soup . 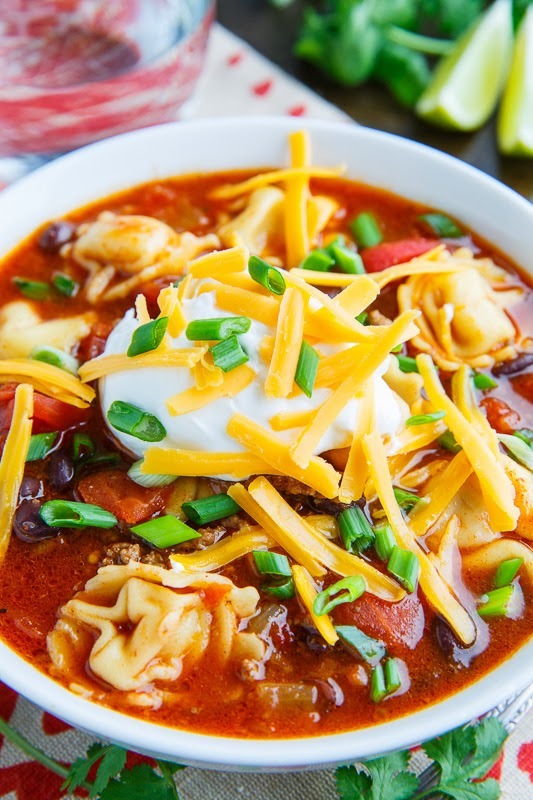 I love the idea of using tortellini in chili! I made this over the weekend and it was so good! I used ground turkey. I will definitely make this again. I went to the store and bought everything I didn't have for this recipe. All but the tortellini is on simmering. It is sooooo good I can't help tasting it every time I walk by. Triple thumbs up!! How much dried tortellini can I use for this chili? I can’t seem to find fresh in my area. I have 8 oz. package of dried, would I use the whole package or just some of it? Use the whole 8 ounce package and add some extra broth or water as needed. Enjoy!